Inglewood Approves Plan For NFL Stadium, In Deal Involving Rams Owner : The Two-Way The unanimous vote Tuesday night came after "a consultant compared stadium noise in surrounding neighborhoods to that of bird calls," KPCC reports. Fans hold a "Los Angeles Rams" sign during a San Diego Chargers game against the St. Louis Rams last year. Both teams are part of proposals to build new NFL stadiums in the LA area. 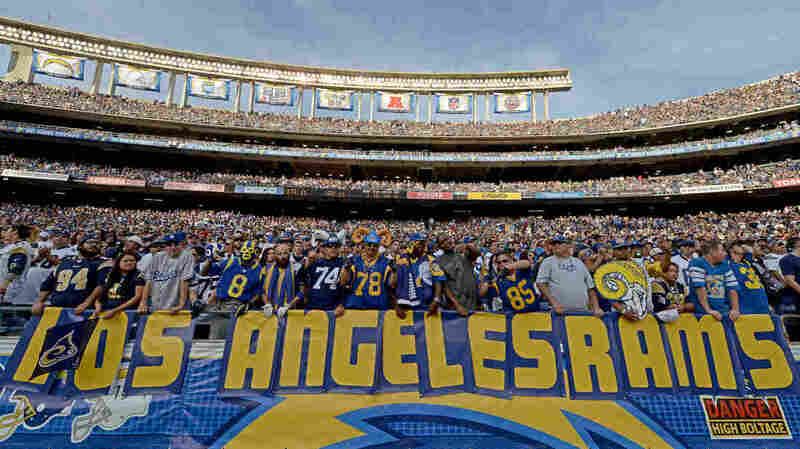 The Los Angeles area is another step closer to hosting an NFL team, after the Inglewood, Calif., City Council approved a proposal for an 80,000-seat NFL stadium. The development plan includes St. Louis Rams owner Stan Kroenke. The unanimous vote Tuesday night came after "a consultant compared stadium noise in surrounding neighborhoods to that of bird calls," member station KPCC's Ben Bergman reports. The Inglewood deal doesn't have a team attached — but it's widely believed that Kroenke wants to move the Rams out of St. Louis, where he's been locked in a dispute over revamping the team's current stadium, the Edward Jones Dome. These are busy times for stadium planners in and around Los Angeles. Last Friday, the San Diego Chargers and Oakland Raiders announced they might share a new stadium in Carson, just south of Los Angeles. Both of those teams are also negotiating for new stadiums in their host cities. The proposals are expensive: The Inglewood proposal would cost around $2 billion, and the Carson plan would cost $1.7 billion. Both the Raiders-Chargers proposal and the one backed by Kroenke could bring the NFL back to the LA area soon after the 2015 season — a proposition that has put local governments on high alert. "Like Peyton Manning running the hurry-up offense, both Carson and Inglewood have been trying to move as fast as possible to get stadiums built," Ben reports from KPCC. He adds, 'Hundreds of fans packed the City Council meeting, many decked out in jerseys and even horned hats bearing the Rams logo, the football team that left LA two decades ago." Before any NFL team moves to the Los Angeles area, at least three-quarters of the league's team owners would have to approve the deal. "I'd say the chances of there being a team playing in LA in 2016 is less than 50-50," sports economist Victor Matheson recently told Morning Edition. Noting that the NFL's revenue-sharing arrangement spreads profits around regardless of market size, Matheson noted that the Rams, Raiders and Chargers simply want new stadiums — in whichever city they can get them financed and built.